Zapier gives you the flexibility to automate tasks between online apps (like Twitter, Gmail, Facebook etc) and helps to save time. Using Teamie's Zapier Integration, whenever something happens on an external service (like new post in a blog / social sites), you can trigger a post to be created automatically on Teamie (the posts could also be drafts or scheduled). All you need to do is automate your tasks on Zapier and the rest will be taken care of "automagically"! So, automate, sit back and relax! To create a Zapier account, go to Zapier and enter the required details to complete the sign up process. 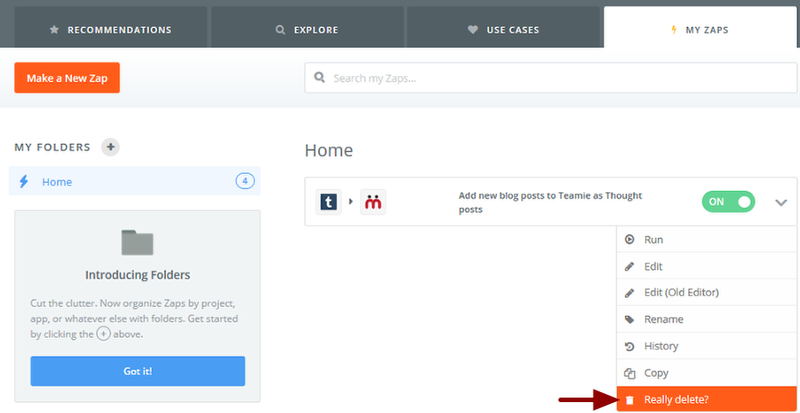 In this article, we will demonstrate you how Zapier creates a Thought post in Teamie, whenever a new post gets created in your Tumblr blog. 1. Click Make a New Zap on your dashboard. 2. Enter a name for your Zap. This is for identifying your Zap in the dashboard. 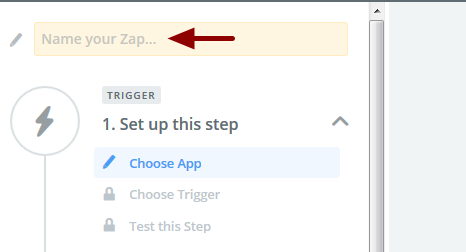 After giving a name for your Zap, you'll have to choose the trigger app for your Zap. 3. Select the Trigger app from the list or type the name of app you are looking for in the search box for quick search. 4. Select any Tumblr trigger from the list shown below as per your choice and then click Save+Continue. 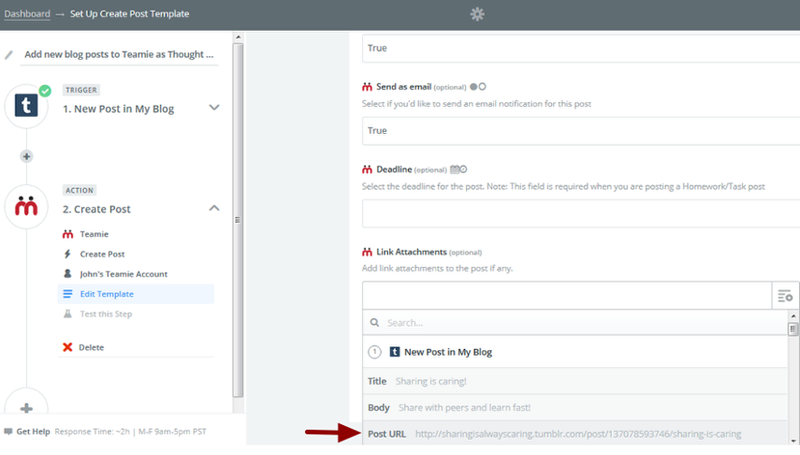 Here we have selected "New Post in My Blog" Tumblr trigger which will be triggered when a new post is created in a specific blog and that blog post will be created in Teamie as Thought post. Note: You can select only one trigger at a time. 5. On Choose Account page, you will see the list of all the account connections you have made for the Tumblr app. Select an account for the trigger app. Click Test Account to check if the account working fine or not. Note: In case you wish to use a different account for the trigger app then simply click Connect a New account and add a new account connection. 6. If everything is good to go then you will be notified that account is working fine. Click Save+Continue to proceed. 7. Select a blog from the drop-down to watch for new posts. 9. You will notify you that you must at least one recent post in your blog for your Zap to work. Click Fetch & Continue to check if you have configured your trigger Zap correctly. 10. If Zap configuration is correct, you will see a success message. Click Continue to set up your action Zap. 1. Select Teamie app as your Action app. 2. Select a Teamie action from the list and click Save+Continue. Note: Save+Continue saves the data/changes made on the current page and takes user to the next configuration page. Create Post - Creates a new post immediately as soon as trigger happens. Create Draft Post - Creates a draft post. Create Scheduled Post - Creates a scheduled post. 3. Click Connect a New Account to add a new account connection of Teamie site. 4. Enter the Teamie site URL of your institution and click Yes, Continue. 5. Click Authorize to allow Zapier to access your account so that it can perform actions on the site. 6. 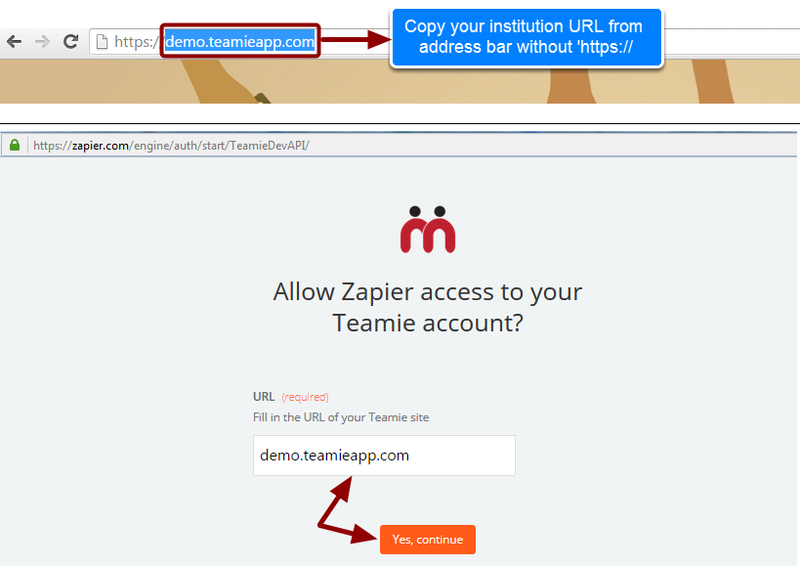 Clicking Authorize will connect the selected account with Teamie action app in Zapier. You can then give your Account a title or label, which is just for your convenience and helps you identify the account on Zapier. 7. Click Test Account to check if account is working or not. 8. If everything is configured properly then you will see a message "Account is working fine". Click Save+Continue to proceed. 9. Select the Post Type you would like to create from the drop-down list. 10. Select the classroom from the drop-down list to share the post with. Note:​ Select multiple classrooms if you wish to share the post in multiple classrooms. a. Title: When trigger takes place, the title of the blog post becomes the text of the post in Teamie. b. 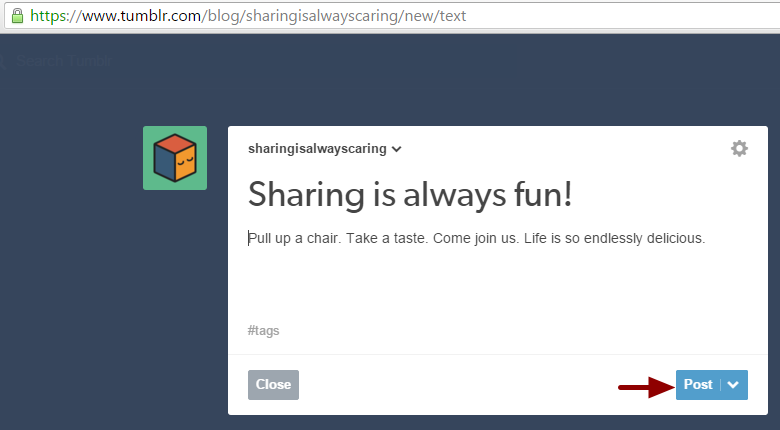 Body: Content entered in the body of the blog post becomes the text of the post in Teamie. c. Post URL: Blog URL get attached as a link attachment when post gets created in Teamie. d. Summary: Summary of the blog post becomes the text of the post in Teamie. Note: Teamie cannot add or remove any fields from the drop-down as we don't have control over these options as they are handled by Zapier. 12. We strongly recommend our users to use hashtag while setting up the Teamie action app. This will give you the flexibility to filter for the posts which gets created through Zapier. 13. Select True or False value for the lock comments field from the drop-down. 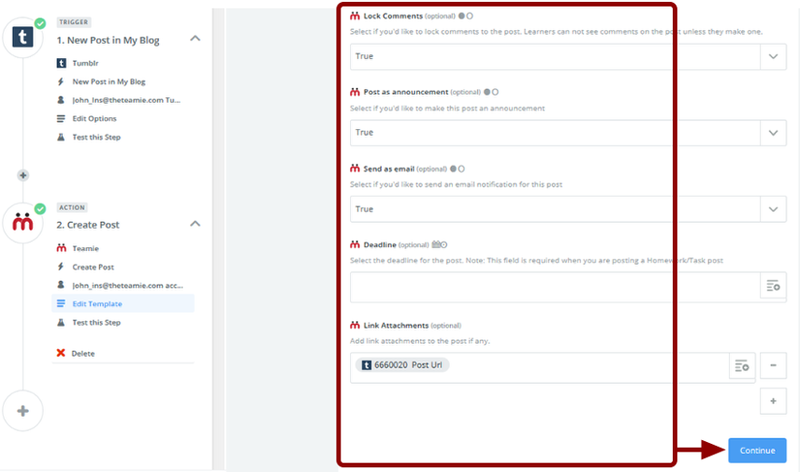 Selecting True will restrict users from viewing other users comments until they post a comment of their own first. If False then users can view comments posted by other users without the need of commenting first. 14. Select True for the Post as announcement field if you want to share this post as an announcement, else leave it blank or set to False. 15. Select True for the Send as email field if you want to send an email notification to all classroom members about this post, else leave it blank or set to False. 16. Select Post URL from Link Attachments drop-down list to attach the blog URL as link attachment in the post. 17. Click Continue to save the changes. 18. You will see the configured options you have selected for each field in edit template. Click Create & Continue. 19. If configuration is correct then you will see a successful message “Test Successful". Click Finish to complete the Zap creation process and exit the configuration page. 20. Newly created Zaps will remain off by default. Click "YOUR ZAP IS" toggle button to turn on your Zap. 21. Now your Zap is running and you can validate the Zap functionality. Your Zap will check your Tumblr New Post in My Blog trigger every 15 minutes. Note: The Zap checking time is dependent on the subscription plan used by the user. In this article, we will demonstrate you how an RSS (really simple syndication) feed helps you in getting the content from a frequently updated source, such as a blog, or news site with just the key information. 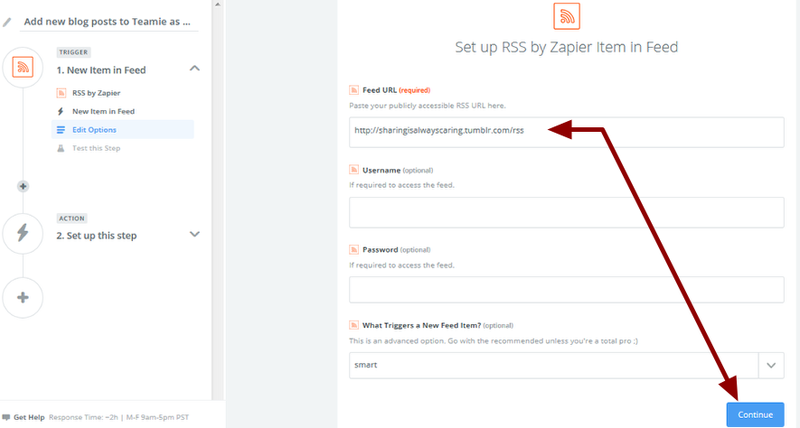 To start triggering content from a RSS feed using Zapier, you will need to choose "RSS by Zapier" as your Trigger Zap and then you'll be able to connect to your public feed. The first thing you'll want to do is pick the trigger app for your Zap. 3. Select the Trigger app from the list or type the name of app you are looking for in the search box. 4. Select RSS trigger and then click Save+Continue. 5. Enter the URL of your feed into the "Feed URL" field. If your feed is private (and requires a login to view) then enter your username and password here below. If not leave those fields blank and click Continue. 6. Zapier will notify you that you must have at least one recent item in your your feed created. Click Fetch & Continue to check if you have configured your trigger Zap correctly. 7. If Zap configuration is correct, you will see a success message. Click Continue to set up your action Zap. 2. Select Create Draft Post from the list and click Save+Continue. 3. You will see the list of Teamie account you have added earlier in Zapier. Select the required account and click Test Account to check if it is valid /active account. 4. If everything is configured correctly then you will see a message saying that account is working fine. Click Save+Continue to go to the next page. 5. Select the Post Type you would like to create from the drop-down. 6. Select the classroom from the drop-down list to share the post with. 7. Click Insert a Field and choose the required option from the drop-down list. 8. We strongly recommend our users to use hashtag while setting up the Teamie action app. This will give you the flexibility to filter the posts which get created through Zapier. 9. Select True or False value for the lock comments field from the drop-down list. 10. Select Link option from the drop-down list to attach the Feed URL as a link attachment in the post and then click Save+Continue. 11. You will see the value given for each field in edit template. Click Create & Continue. 12. If configuration is correct then you will see a success “Test Successful”. Click Finish to complete the Zap creation process and exit the configuration page. 13. Newly created Zaps will remain off by default. Click "YOUR Zap IS" toggle to turn on your Zap. 14. Now your Zap is running. 15. A draft post will be created in Teamie whenever you have a new recent item feed created in your public RSS feed. It is not necessary to create a new Zap for different Teamie actions. You can change / update the configuration of existing Zaps you have created and select other options as per your requirement. For example, you have set up a Zap which is instructed to publish a post in Teamie each time you have a recent item created in your feed. You can change the action in Teamie app to some other action (“Create Draft Post” or “Create Scheduled Post”) and save the changes rather than creating a Zap from scratch each time. 1. To edit a Zap, please read this article on how to “Edit a zap”. 3. You will see the list of Teamie accounts you have added earlier in Zapier. Select an account and click Test Account to check if it is a valid /active account or not and then click Continue to proceed. 5. Select the classroom​ from the drop-down list to share the post with and click Insert a Field​ to choose the required option from the drop-down list. 6. We strongly recommend our users to use hashtag ​while setting up the Teamie action app. This will give you the flexibility to filter the posts which get created through Zapier. 7. You must select a supported time format to enter in the Scheduled Time field while creating a Scheduled Post within Teamie through Zapier. Zapier also gives you the freedom to modify times and dates. To do so please go through the list of supported time format Zapier supports. 8. Below is the list of supported datetimes by Zapier. We would recommend our users to go with first two formats because it is easier to use and read. 9. Though you have seen the list of supported time formats in step 8, you can modify these parameters as per Zapier suggestions. Note: You need a space between the placeholder and the adjustment, or it will not work. +7h – A post will be published within Teamie 7 hours after the date/time in the field. +10d – A post will be published 10 days after the date/time in the field. 11. 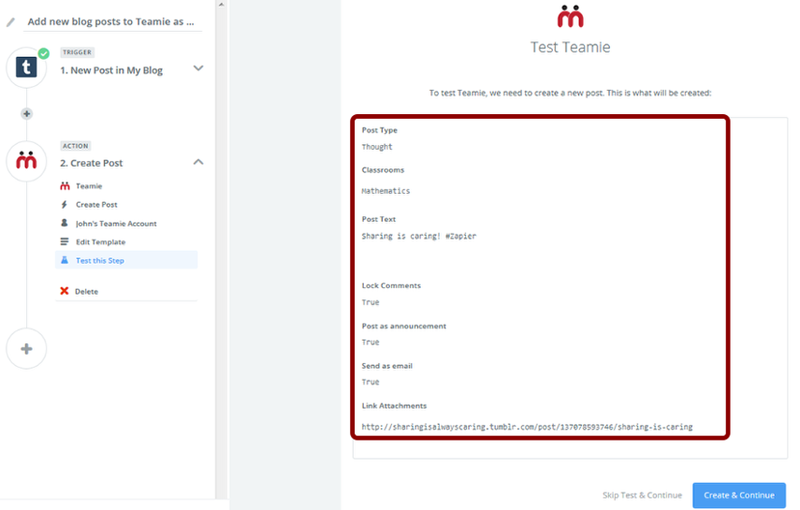 In this case, a Scheduled post will be created in Teamie as soon as trigger happens in Zapier but the post will be posted within the assigned Teamie classroom 1 hour 10 m later. 12. Select the required value for Lock Comments and Post as announcement fields from drop-down list. 13. You must select the deadline for the post if you have selected the Post Type as Homework in your action app otherwise Zap will not work. You can refer to 8, 9 and 10 to understand the modifier option for the Deadline field. Here we have selected a date parameter as “next friday at 7pm”. This means any homework posts which get created within Teamie through Zapier, will have a deadline till coming Friday, after which learners won’t be able to make an attempt to it. 14. You can also enter value for Deadline field in days. Here “+4d” option indicates that any homework/task post which get created within Teamie through Zapier will expire after 4 days. 15. You will see the value given for each field in edit template. Click Create & Continue. 16. If configuration is correct then you will see a success message “Test Successful”. Click Finish ​to complete the Zap creation process and exit the configuration page. 17. A Scheduled post will be created in Teamie whenever you have a new recent item feed created in your public RSS feed. Your dashboard is the place where you can manage your Zaps. You can run your Zap manually if you wish to verify whether your Zap is working fine or not without having to wait for 15 minutes. 1. Go to your dashboard. Select Run from the drop-down to run the trigger. 2. Your Zap starts and checks for new posts in your Tumblr blog. If there is any new post created in your blog then that a post will be created on Teamie, if not then no action will be taken. 1. Go to the Tumblr blog which have been selected in your Trigger app and create a new post by adding the required content and clicking Post. 2. Your post gets added to the blog. 1. Run the Zap manually to check if Zap is working fine. 2. 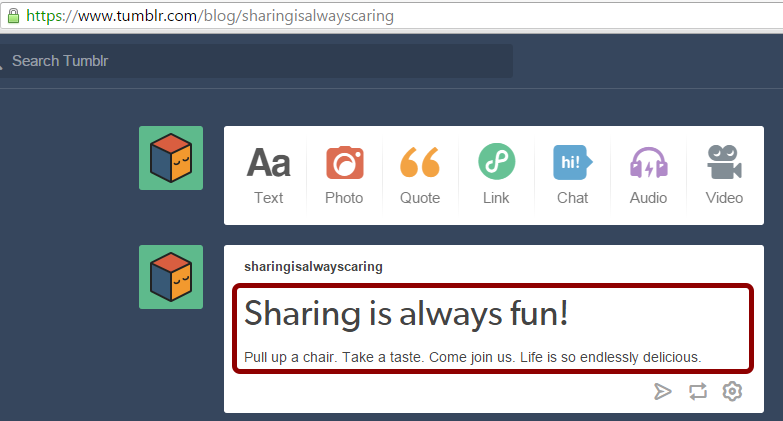 If everything is good to go then Zapier creates a thought post in Teamie whenever a new post get created in your Tumblr blog. 1. Task history is the place which log all the activity of your Zap. To view your task history, hover your cursor over your profile picture in the top right and select Task History option from the drop-down list. 2. You can see the status of an activity done by your Zap; whether it was executed successfully or not. Each Task may have one of the following statuses. Success: This Task was successful. Error: This Task ran into some problem, click it for more details. If a Zap gets too many errors in a row, it will be automatically paused. Filtered: This Task was stopped because your Zap (custom) filters prevented it from continuing. Halted: This Task was stopped on purpose by Zapier. Unlike errors, many halted Tasks will not automatically pause your Zap. So such errors will be marked as halted by Zapier. Pending: Sometimes Zapier needs extra time to perform a Task. In this case, the task will be marked Pending. 3. Click Task for more details. 1. On your dashboard, choose a Zap whose settings you wish to change and select Edit from the drop-down list. 2. In this case, Tumblr app is your trigger app and currently selected trigger is "New Post in My Blog". So if you wish to select any other Tumblr trigger from the given list then select mark the required trigger and click Continue to save the changes. 3. In Teamie action app, currently selected action is "Create Post". If you wish to change the action from Create post to Create Scheduled Post or Draft Post then select the required action and click Continue to save the changes. a. Post Type: Allows changing the Post Type from Thought to Question or Homework. b. 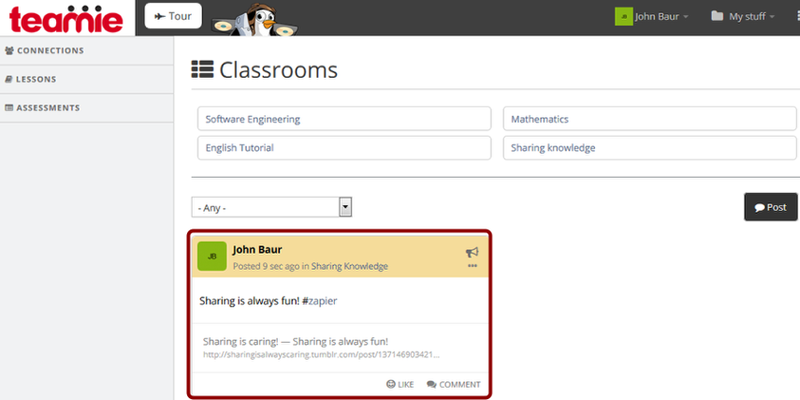 Classrooms: Allows changing other classroom to share the post with. c. Post Text: Allows changing other field to be picked as post title in Teamie and also change the hashtag if needed. d. Lock Comments: Can select False value for this field if it was set as Yes earlier or vice versa. e. Post as announcement: Can select False value for this field if it was set as Yes earlier or vice versa. f. Send as email: Can select False value for this field if it was set as Yes earlier or vice versa. g. Deadline: Change the deadline format. Deadline field is required only when creating a Homework post. h. Link Attachments: Select the link attachments value from the drop-down list as per your requirement. Once you have completed the editing part, click Continue to save the changes. Note: When you make changes in your Zap and save, your Zap will be turned off. To make Zap working, you need to turn it on again. Please see section "Creating a Zap" which explains how to turn on your Zap. 1. On your dashboard, choose a Zap you wish to delete and select Delete from the drop-down list. 2. Zapier confirms before deleting the Zap. Click Really delete? to confirm and delete the Zap permanently. 3. A notification appears confirming that Zap has been deleted. Click Make a New Zap if you wish to create a brand new Zap. 1. Hover your cursor over your profile picture in the top right and select Connected Accounts from the drop-down list. 2. The Connected Accounts page is the place where you can see all the different services you have connected with Zapier. 1. If you wish to delete any of the service account you have connected with Zapier, then choose an account and click Disconnect. 2. Zapier asks confirmation before deleting the connected service account from Zapier, Click Really? to confirm and delete the account. 3.The moment you click confirm deleting action, that service account will be removed from your Zapier connected accounts list. Note: Please make sure you are not deleting any of the service account which has been used in any of the active Zap, because deleting an account makes the Zap inactive and that Zap will stop working. 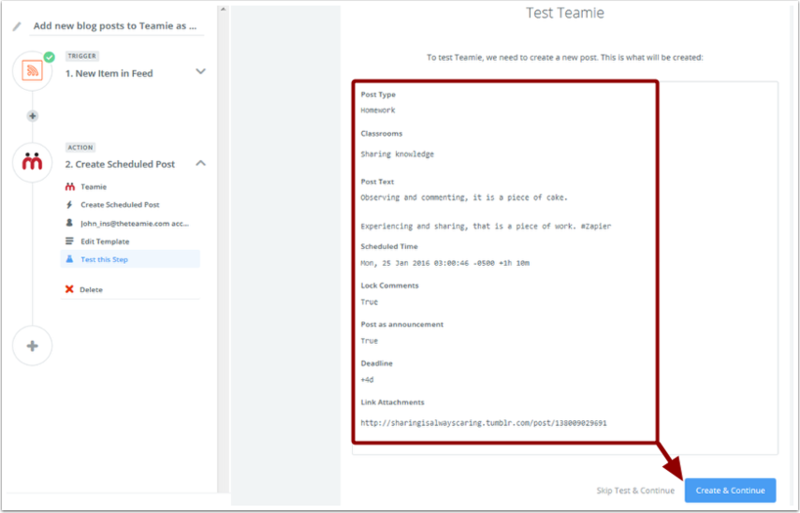 The fields shown below are not applicable for users having learner role in a classroom within Teamie and should not be selected while setting up the Teamie action Zap . Even though learners can enable these fields, they will not work in Teamie each time Zap runs. Homework: Currently in Teamie user having learner role are allowed to create Thought or Question posts, but they cannot create Homework posts and ability to create Homework posts is given to users having Instructor role or higher. Lock Comments: Users having Instructor role or beyond can use Lock Comments feature and currently learners are not supposed to use it. Post an announcement: Users having Instructor role or beyond can share a post as an announcement in a classroom whereas learners are not allowed to do it. Send as email: Users having Instructor role or beyond can send an email notification to all classroom members when a post gets created as an announcement whereas learners are not allowed to do it.